The descriptors for this wine, while not especially negative, were not exactly positive, either. One taster found a "smoky bouquet to this red which is big and chewy, a little bit hot and it has a mushroomy finish." Most other tasters found this diluted, saying it's "light, thin and watery." 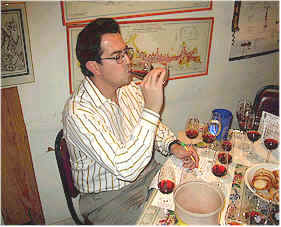 Another person found it to have a "promising nose but a watery taste." One taster questioned whether or not this has a bit of volatile acidity. Someone else found "asparagus" notes. One critic found "light fruit and a hint of tobacco," while someone else said "it simply doesn't deliver on the palate." I found some mildly smoky elements to the fragrance with some woodsy and woody notes. I detected a fragrance reminiscent of Band-aids or, at least, a resiny note which made it less attractive. It's rather light on the palate, with low intensity fruit and a hint of gamey Pinot Noir. One-half star (on my three star scale...no stars being an ordinary or average quality wine). The tasters felt this wine was a bit prematurely old. One critic said it's "got an older appearance with less fruit and some sweet oak, but it's only 'so-so' in quality." Another said "there's no reason to hold on to this wine," to which someone else added "Yes...and there's no reason to buy it, either!" One panel member found notes of "rhubarb and toffee," adding "it's pretty straightforward and is nothing special." A more critical voice found some "SO2 with stinky, green bean-like notes. It's sharp, metallic, bitter and hot." Another critic was not taken by the "funky, green olive nose and green olive juice flavors on the palate." I noted some sweet fruit aromas with an earthy tone to the nose. There's a vanillin note from the wood and it is, to my taste, somewhat along the lines of a French Burgundy. 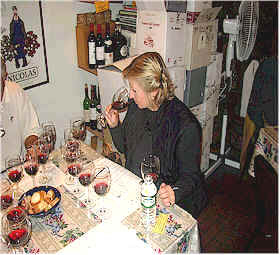 On the palate, though, the wine displays more heat than charm. One-half star at best. Described by one taster as "sharp, tough and it has a short finish," this impressively heavy bottle of Pinot Noir should have fared better given its amazingly ridiculous price. One person felt "the oak obliterated the fruit...it was more like wood-flavored water." Someone else criticized the wine for "falling apart in the glass." Another taster found it to have a "nice, smooth oak character." Someone described it as "red fruit punch," while a chef in the crowd found it reminiscent "of cooked root vegetables." Another taster found "notes of forest floor fragrances, with a medicinal cherry-like fruit. It's nicely balanced with hints of cola nuts but it faded as it sat in the glass." I found a nice fragrance of smoked cherry fruit on the nose with a modest amount of wood. There's a cherry and berry quality to the fruit with a mildly oaky finish. I gave it a one star rating, but felt the wine is worth closer to $25 than it is to $100. The "scarcity tax" here is shockingly high. This wine proved controversial, with a number of fans and an equal number of detractors. One person said "I recoiled from the first chemically scent and this did nothing for me on the palate." Another taster encountered a character they likened to baby diapers or latex! Someone else said this was much like "cherry flavored soda pop." Another taster found "sour veggies and cherry cola." More positively, one person found "Herbal, jammy, blackberryish notes with a very silky texture and flavors of licorice and pears." Another fan found "A big nose with red fruits and tree bark and a spice cabinet featuring cinnamon and ginger." A final taster found "those diaper-like notes with a sweet, sort of rotting character which I found repulsive, but the flavors were minerally." I described this as having a mild spice character and some red fruit notes, but didn't feel it was much in the style of a French red Burgundy. I think the "oatmeal" note I found on the nose is what others likened to latex. There's some cherry notes on the palate, but, again, nothing reminiscent of top Burgundy. Perfectly standard to my taste. One taster felt there was a slight musty note in this wine, but nobody else mentioned this. They found "a little bit of sweetness and it's too hot and alcoholic." One person found it "pretty weak, overall. A bit of smokiness and oak, with a cranberry fruit-like character." A third taster felt this has "Good structure and it's a solid wine." Another person found "baked berry compote aromas with a full, creamy structure and a little bitterness." Someone else found "alcoholic on the nose with light fruit at first. Then it shows some sage and bramble notes." One woman exclaimed "I loved this! It reminds me of Russian gunpowder tea! It's a little bit acidic, but the flavors fulfilled the promise of the aromas." I found some light forest-floor fragrances with a woodsy note and some pencil lead aromas. I felt it was a shade more tannic than most of the other wines, being a bit shy of fruit on the palate. Having been a fan of Keyhole Ranch bottlings previously, this one is my least favorite. One star at best. "The aromas leaped out here, with berries and lots of nice fruit and it has a good finish." said one taster. Another felt "it lacks complexity but has nice fruit." Someone else said it was "more reminiscent of Cabernet on the nose with a bit of cherry and berry fruit." A fourth person questioned whether or note there's a musty note here. A few people said they had encountered that element but it dissipated and wasn't an issue. But one person found this bothersome, saying the fragrance reminded them of "a wet horse blanket." Someone else found this "musty with fig-like fruit and high alcohol." I detected more sweet, ripe cherry notes on the nose and a light vanillin character. I felt there's a nice core of fruit to go with that level of oak. It seemed to have a bit more stuffing than most of the others, so I wonder if they "adjusted" this with a wine of more color and body? It's not especially Burgundian, but a nicely made Pinot. One star to one-and-a-half stars. The vintner is a family-operated winery: Gallo. One taster felt this "was the best wine of the bunch. It's got really nice fruit of Pinot Noir." 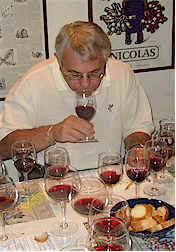 Another taster enjoyed this wine's "creamy texture." Someone else found it to be "a touch earthy, with some spice and pepper notes, but a flat finish with a lot of oak." One person felt this "got better over the course of the tasting. It's got a hint of a gingerbread character." Someone else found it "pointedly tart" and this sentiment was echoed by another person who felt it "is very high in acidity." I liked the fragrances which reminded me of smoke and candle wax aromas with some cherryish fruit and nice, sweet oak. I felt the wine might have a tiny bit of residual sugar (tested it later...it tested close to dry, but not bone dry). The flavors are attractive, with hints of cherry pipe tobacco on the palate. One-and-a-half stars, solidly. Well-liked by many tasters, one person said it "is somewhat buttery and has good balance." Another person found "lots of vanilla oak, but a short finish." A third taster felt this "has a long finish." Someone else found raspberry and cola notes on the nose." Another person said "It's a great Thanksgiving wine with clove, nutmeg and pumpkin pie spices." I liked the sweet cherry fruit on the nose and palate, as well as the nice use of sweet, French oak. There's a touch of a smoky note to the nose. Very nice. One-and-a-half stars.